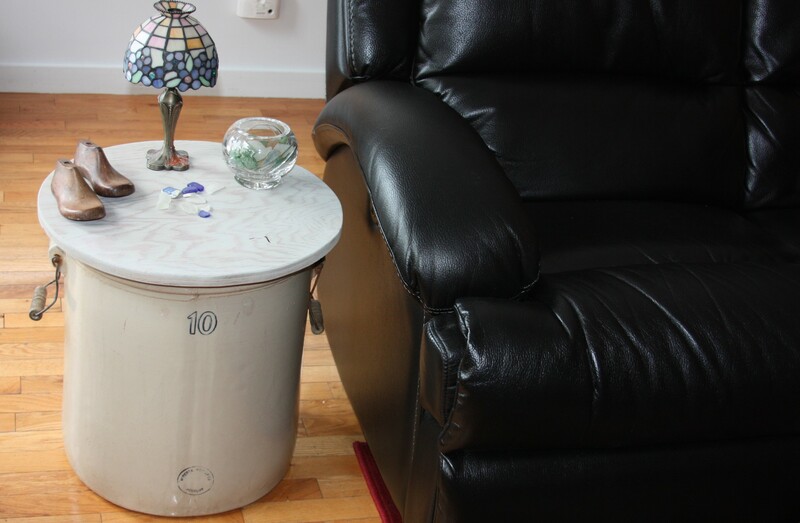 What do you do when you need an end table and there is no money in the budget for one?? Well you make one out of something you already have. 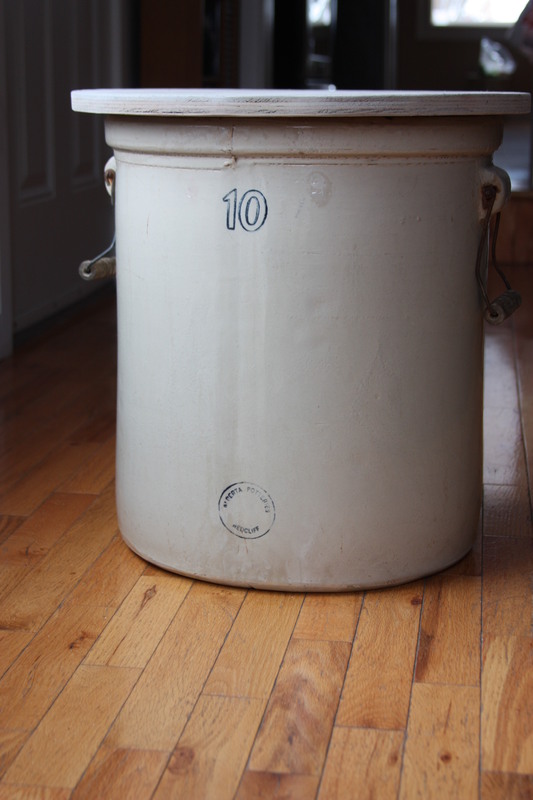 I am always so excited when I can repurpose something I already own into something useful that I need……and that happened to be my antique 10 gallon Medalta crock.I asked L if he had any wood that I could use for a top and lucky for me he did. As I mentioned before, he doesn’t let me use any of the fun tools so he cut and sanded a piece of wood for the top. LOL that’s ok, it just makes him part of the process. I loved the grain of the wood but didn’t love the color of the wood so I got out somecraft paint and starting mixing my own. I used 3 parts white, one part black and one part water to get this lovely gray. I used a sponge to apply, waited about 30 seconds then wiped it off with a lint free rag. I did this a few times until I got the color I wanted. Once it was dry, I popped the top on the crock, styled it and put it to use. I’m thinking it might need a more antique look but that’s a project for another day. All the seaglass was found on my favorite beach in Cape Breton (Henry’s Haven). I can’t wait to style this for Christmas. I love the rustic look of it – I think it is indeed A Wandaful Thing!!! 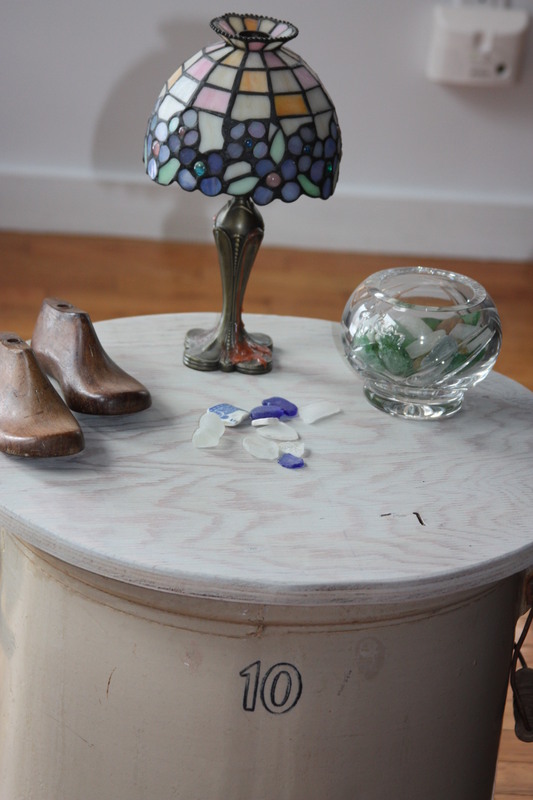 This entry was posted in DIY and tagged 10 gallon, antique, beach, Cape Breton, challenge, crock, DIY, easy, living, medalta, paint, seaglass, wood. Bookmark the permalink. Thank you for your lovely comment. I enjoy linking up to Charm Bracelet Diva when my content is relevant. I’ve discovered so many wonderful talented people to follow. Good choice of paint for the top – like seeing some grain in the wood. Well done.